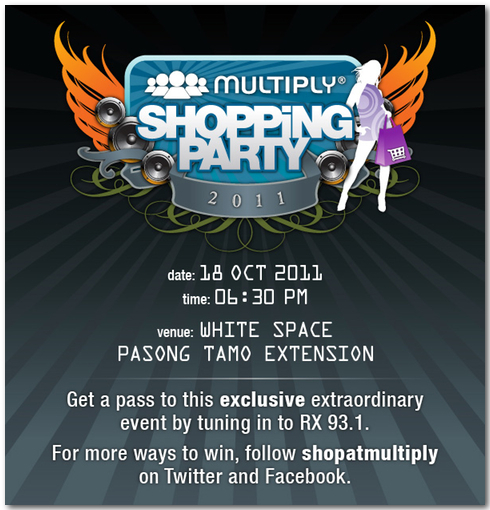 Are you ready for the Multiply Shopping Party? Multiply has certainly gone a long way since I had been a subscriber. At that time, I was more concerned with uploading photos, playlists, journal entries, and receiving comments and guestbook messages. Oh, and also personalizing my account's design. It was a personal website of sort, for those who were looking to have a free online space that can offer exactly those things. Being one of the most popularly used mediums, online entrepreneurs took notice of the opportunity and photo albums of products started sprouting like beans. I remember my first online purchase being from Anagon Collection, whose owner now happens to be a good friend of mine and is a fellow blogger, Ana Gonzales. Multiply has certainly gone far since that first time I signed up for an account. Now with their newly launched design and marketplace, Multiply Philippines is looking to take the shopping experience to the next level with their Multiply Shopping Party! I'm so excited when I was told I had won invites by telling them--just by tweeting--why I wanted to go to the #MultiplyShoppingParty. Multiply really has revolutionized our online shopping experience and now, I can't wait to experience how they will put two-and-two together with their 'shopping party' and also revolutionize the party scene! With only 5 days to go, there are still a lot of chances for you to score invites! Bloggers have been giving away invites like crazy, and so has Multiply. All you have to do is follow them on Twitter and Facebook to be updated with their contests. I swear, it's THAT easy to win invites! So stay tuned to your timeline because Multiply might just let it rain invites again in a bit! I just picked up my invites from their office last Sunday and I'm really excited (really cool office, btw)! :) Looking forward to seeing you all there! I've never heard of this! How fun, and lucky you! I would love for you to check out my blog and follow-let me know Ill follow back!